Ethiopia’s Ministry of Mines, Petroleum and Natural Gas (MoMPNG) said it cancelled recently renewed controversial license of MIDROC Gold, the largest gold mine in Ethiopia after protesters took to the streets for the last ten days. 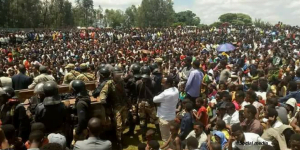 Today’s decision by the ministry followed the killing of two protesters yesterday by the Oromia regional state’s security forces in the town of Shakiso in Guji zone of the Oromia regional state in southern Ethiopia. A third, businessman named Shakiso Guta was also killed by security forces while driving to the city of Adola, according to activists. The ministry renewed the license for Ethiopia’s largest gold mine owned by MEDROC Gold and is located in Lege Dembi, Shakiso Weredas of Guji zone in Oromia regional state, around two weeks ago. The protests erupted last week in Shakiso and Adola towns and their environs following news of the renewal of the gold mine’s license for another ten years by the Ministry .The license has been suspended last year after similar protests erupted. Several subsequent media reports, including one by the Oromia Broadcasting Network, and the BBCAmharic servicerevealed grave health crisis among the community including birth defects, respiratory problems and miscarriages, which the locals blame were caused by the gold mine’s two decades discharges of toxic substances including, cyanide. The ministry said the license will remain suspended until after an independent study involving several stakeholders is conducted in to the allegations of the health crisis. Over the weekend, Motuma Mekassa, who was the minister of MoMPNG when the license was renewed and who is currently the minister of defense, went to the area to discuss with the locals about their concerns. But the meeting ended without results. Last week, Dr. Negeri Lencho, communication head of the Oromia regional state, said that “any investment should be there to help the people, not hurt them.” He also said the regional government will not work against the demands of the people. Midroc Gold mining contract for Lege Dembi site has been suspended. This is a late decision. It should have never been renewed at first place leading to death and injury of protesters. Now the following steps need to be taken. 1- Domestic and international experts should undertake independent and impartial investigation to determine whether the company has used chemicals that are causing damage to human, plant and animals health in the area. The mine should stop operation and remain sealed to ensure they do not tamper with evidence. Experts should make public the process and result of their investigation. 2- Once experts make their finding public, if and its very likely Midroc is found in violation, the contract should be cancelled, the company’s property confiscated and legal action must be taken against the owner and managers. Government of Oromia State should take over the mine, develop it by-itself or contract it to responsible and efficient company. In either case local residents affected by the mine should be given significant share to ensure future generations are cared for. 3- Immediate and independent investigation should be launched on other mines, farms and factories owned and operated by Midroc for causing harm to environment and public health. There is already widespread complaint. If the company is found in violation, its property shall be confiscated and the company/ managers must be brought to court. 4- it is strongly suspected that Midroc acquired Lege Dembi, other mining sites and farm lands in corruption. Investigation should be launched to weed out such corruption and publish those involved. Midroc has long been accused of being king of corruption, hence it should be used as example for other companies. 5- lawyers working on lawsuits against Midroc for harm it caused should intensify and expand their work. The public should provide them with necessary support. 2- Itti bahi ogeeyyotaa faalama kan uume MIDROC ta’uu erga mirkaneessanii booda iddoon albuudaa sun irraa fuudhamee, kubbaaniyyaa biraatiif ykn harka MNO akka galu gochuu. Invastarri dhuunfaas ta’ee mootummaan ( state) omisha kan itti fufu yoo ta’e ummanni naannawa sanii kan miidhamee jiru qabeenya sanirraa hamma murtaa’e share kennamuufi abbaan qabeenyummaanitti fufa qabu akka argatan gochuu. Hubadhaa miidhaan keemikaalli kun geessisu dhaloota dhalootatti dabra. Kanaafuu dhaloonni boruutis waan itti wal’aanamuufi tajaajilamu kaayuufi barbaachisa. 4- Mallammaltummaa albuunni Laga Dambiifi qabeenyi Oromiyaa biroo yeroo MIDROC’tti dabarfamuuf saniis as raaw’atame irratti qorannaan walabaa ( independent investigation) geggeeffamuu qaba. malaalmmaltummaan hojjatame yoo qorannaa kanaan ragaan mirkanaa’e MIDROC fi qondaalonni mootummaa yakka kana keessatti hirmaatan saaxila bahanii adabamuu qabu. 5. Ogeeyyonni seeraa Oromoo hojii haqa lammiilee keenya miidhamanii baasuuf eegalan cimsuun MIDROC fi mootummaa federaalaa irratti himata banuu qabu. Kanarratti ammoo ummanni keenya biyy keessaafi alaa tumsa barbaachisaa godhuufi qaba.